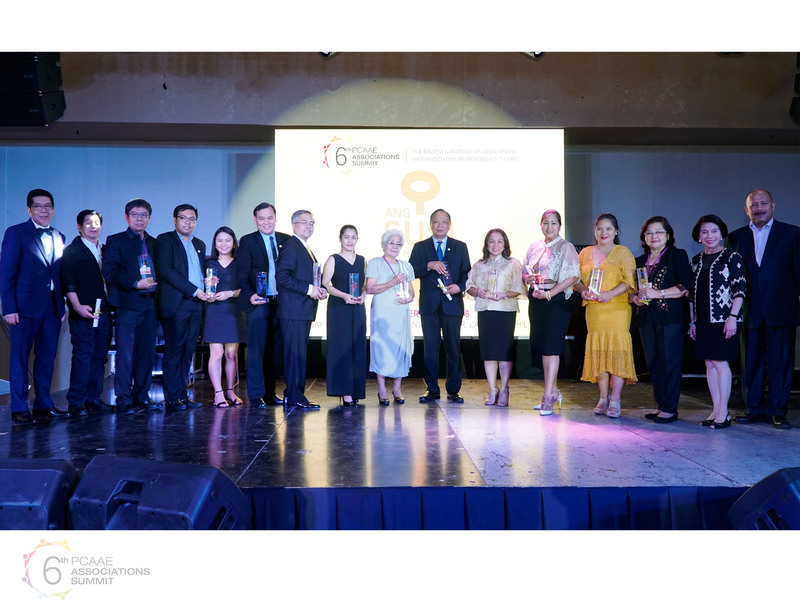 The Philippine Council of Associations and Association Executives (PCAAE) shined the spotlight to its eleven (11) members during the “Ang Susi” Awards 2018 for winning the PCAAE Outstanding Project Awards. The winning members were honored during the “Ang Susi” Awards 2018 & Gala Dinner on November 23, 2018 in conjunction with the PCAAE’s Associations Summit 6 (please see separate story) held at the Subic Bay Exhibition and Convention Center in Subic, Zambales. “Ang Susi” stands for “Associations nurture National Growth through Social Unity and Sustainability Innovations.” It recognizes the key role of associations and other member-serving organizations in national sustainable development. It consists individual and institutional awards. The individual awards are bestowed on outstanding career professionals who have sustainably managed an association and produced remarkable results (“Association Executive of the Year”) and a member of the board of an association or other non-profit membership organizations in the country have demonstrated outstanding service to the association community, to the practice of association good governance, and to the ideals and advocacy of PCAAE (“Association Board Member of the Year”). Manila Bay Sunset Partnership Program, Inc. for its project “Landbank’s Ecobrick Program (Environmental Impact Category). The Philippine Society for Microbiology Inc. and Santiago City Federation of Women’s Clubs for their projects “Microbiology Education Consortium” and “Women’s Empowerment Program”, respectively (People Empowerment Category). iHome Greater Manila Metro Manila, Inc.; Lal-lo Rural Improvement Club Federation, Inc.; Teresa Woman’s Club; United Architects of the Philippines for the projects “Vibes Housing Projects,” Enhanced Livelihood Programs,” School Feeding Program,” and “UAP Bayanihang Arkitektura”, respectively (Community Service Category). ASK Foundation Inc., for its project “Utilizing Digital Technologies through Live Video-Streaming for Cost and Productivity Savings” (Technology Innovation Category); and ASKI Foundations, Inc., for its project “Livelihood for the Extreme Poor (LIFE) Program,” (Change Catalyst Category). For more details about the “Ang Susi” Awards Program, please email [email protected].